The story of the close yet volatile friendship between John Dos Passos and Ernest Hemingway. Biographies, volumes of letters, and memoirs have thoroughly, and repeatedly, revealed the quality of Hemingway’s relationships with F. Scott Fitzgerald, Sherwood Anderson, Gertrude Stein, and Sara and Gerald Murphy, among others: friendships that Hemingway viciously ended. “By 1936,” writes biographer Morris (Eye on the Struggle: Ethel Payne, the First Lady of the Black Press, 2015, etc. ), “Hemingway’s list of lost friends was lengthy.” Morris adds to that list novelist and journalist Dos Passos, whom Hemingway valued for many years—until he did not. Morris’ lively biography of their relationship offers a fresh view of Dos Passos, drawn from published and archival sources, but adds little to the portrait of Hemingway already well established: his love affair with a nurse who tended him during World War I, marriage to Hadley Richardson and early years in Paris, his early fame with The Sun Also Rises, his belligerent competitiveness, betrayals, life in Key West and Havana, and his suicide. The two men could not have been more different: Dos Passos, a friend recalled, was “so shy that he seems cold as an empty cellar with the door locked when you meet him.” Hemingway was brash and gregarious; Dos Passos, irritatingly prickly, “hated small talk.” Dos Passos, politically engaged, actively protested injustice and oppression; Hemingway ignored politics until the Spanish Civil War. 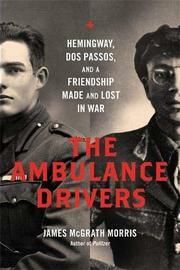 They met briefly as ambulance drivers in 1917, but their friendship began later, when both were at the starts of their careers. Besides drinking and socializing, they became trusted readers of each other’s work. Hemingway gratefully called Dos Passos his “most bitterly severe critic.” Inevitably, though, their friendship devolved. Morris cites “a deep and fundamental difference” in their perception of war, but he portrays Hemingway as so mean, vengeful, and threatened by any other writer’s success that their friendship could not have been anything but doomed. A welcome new look at Dos Passos and another sad chapter in the life of Hemingway.